The pair also chatted about the stories behind the most popular segments on "Late Night with Seth Meyers." If the two of them entering the Writers Guild Theater by running a dead sprint down the aisle was any indication, Andy Samberg and Seth Meyers were ready to have fun Wednesday night. Speaking at the Writers Guild Foundation’s “An Evening with Seth Meyers” event in Los Angeles, the conversation inevitably shifted to the two comedians’ shared time on “Saturday Night Live.” In an experience that Samberg describes as “one of the high points of my life,” Nicolas Cage joined “Weekend Update” for the ongoing “Get in the Cage” segment, one that hadn’t exactly painted the actor in the most flattering light. “It was not even remotely like Nic Cage. It was just a lunatic person that we called Nic Cage. To his enormous credit, he recognized that and thought that was funny and came on ‘SNL’ and we did it as twin Nic Cages,” Samberg said. After he’d agreed to do it, the time came to go over the actual segment. Even though “Get in the Cage” was still built around a parody, they were confident there was enough to ease the tension of having him play alongside a caricature of himself. Then came the pre-show run-through, before it even got to the dress rehearsal stage. The dress rehearsal of the segment is available to watch on YouTube, but what that version doesn’t have is something that shocked both of them when the time came to do it for a live audience. “Then, on air, at the end he slapped the table. You can hear me go ‘Guh! '” Meyers said. 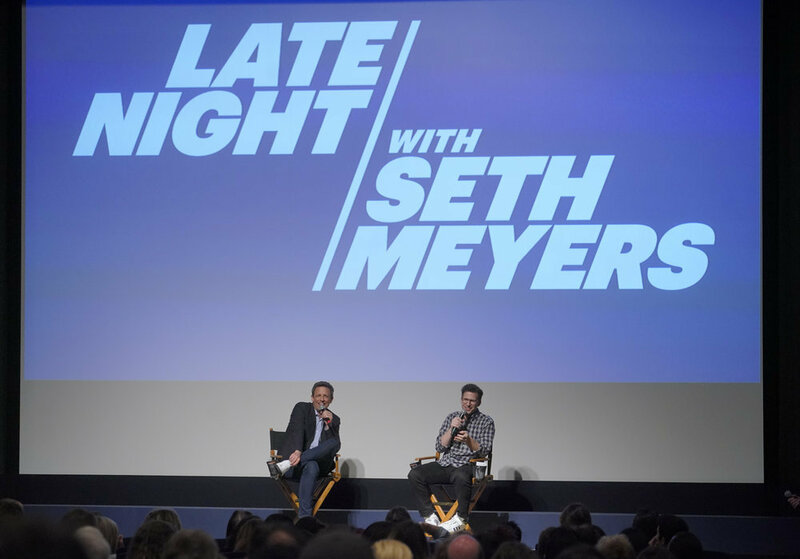 In addition to the “SNL” reminiscing, the pair talked about Meyers’ ongoing role as the host of “Late Night,” breaking down a few of the recurring segments on the show. Eventually, the conversation turned to the ever-popular “Jokes Seth Can’t Tell” and how that comes together on a regular basis. “[Amber Ruffin and Jenny Hagel] write jokes and they also collect jokes from the rest of the staff. I think there’s something that feels naughty to write jokes that can only be saved by the charm of these two really talented performers,” Meyers said. Samberg asked about the vetting process for those particular jokes, if some of them ever get too real in the writers’ room. “Late Night” is off for the week, something that, for him, actually makes following the ever-churning news cycle a little more challenging. “Reading the news, for me, is a lot harder when you don’t have a show. I actually find it very cathartic to get to write Closer Looks and then perform them for an audience. So I feel like it’s actually soothing and healing to follow it, knowing you get to make jokes about it. When we don’t have a show, I feel like I’m muttering in the street,” Meyers said.